Found some cool stuff at Goodwill today... A mid 1960's Smith Corona Corsair Deluxe, and a serial A/B box. I got the typer for $9.99 and the A/B box for $4.99. 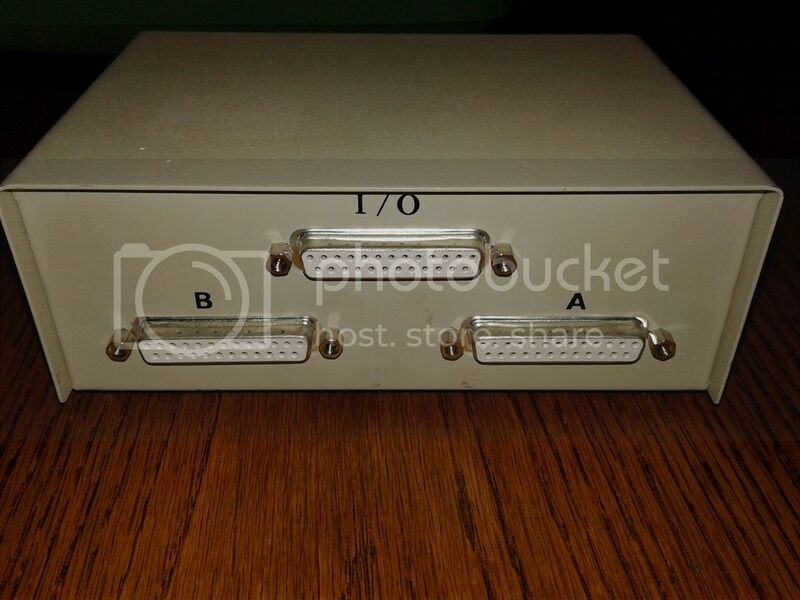 I plan to use this box to switch my TI between my PC (A) and a modem (B). This way I can dial out to the BBSes and then do a quick switcheroo to the PC for file transfers without having to get behind anything to disconnect/reconnect rs232 cables. Edited by Opry99er, Sun Mar 19, 2017 7:28 PM. Yet another keyboard superior to that on the 99/4 and 99/4A! I actually prever my /4A keyboard over most modern keyboards... There is one exception. The keyboard on which I am currently typing is a real winner. I have big hands, so this keyboard is the bees knees. Good mechanical feel to it. I found a boxed TI Super Sketch at a GoodWill a long time ago, but usually extremely rare when you see anything TI specific in the wild. Oh and a boxed Q*bert at a consignment store once. Think that's all I've ever seen all these years. 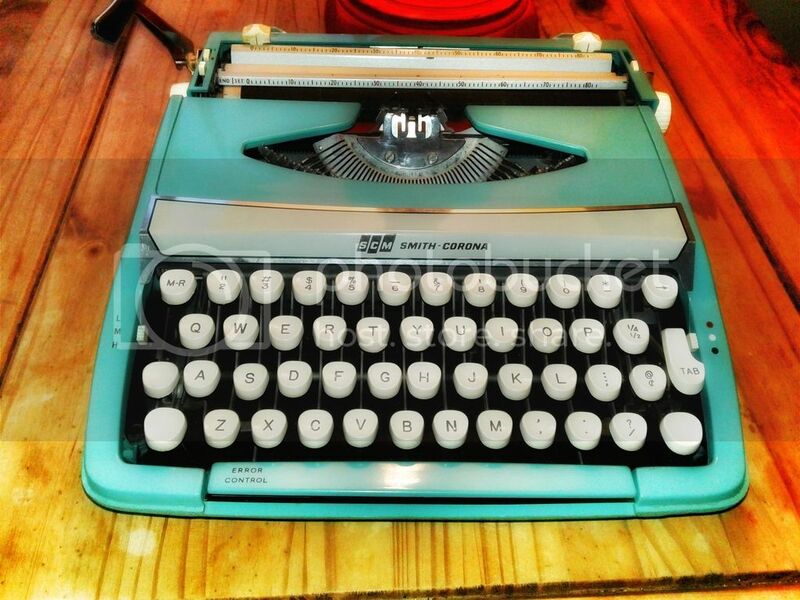 That typewriter is a great score! 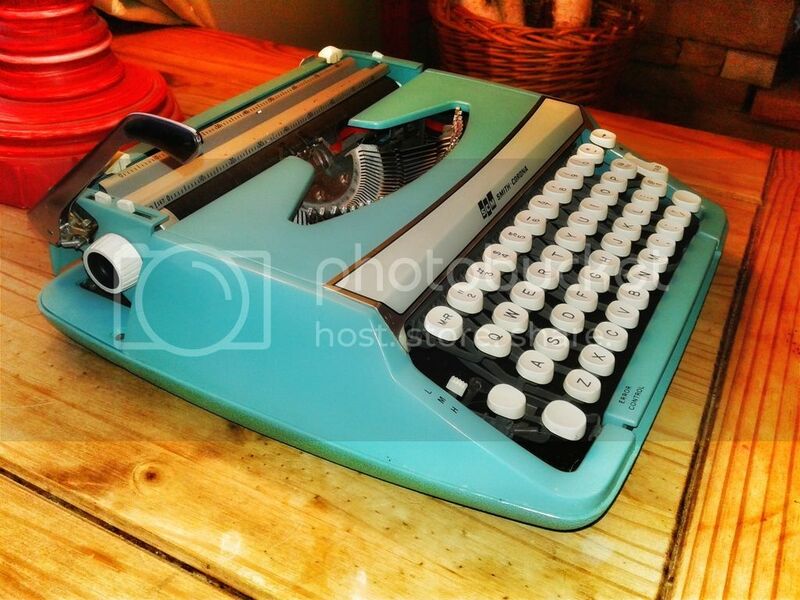 I've always had a soft spot for these having used one throughout my undergraduate studies, but I have been resisting getting one because it's just going to sit there and collect dust... Unless I decide to interface it to the TI ! Get one, Vorticon!!! I have 4 typers and I use them all. Sadly Goodwill is not allowed the resell any computers dropped off at their donation centers. This has probably contributed to the demise of many many classic and retro computer systems. They can only resell keyboards and monitors. Everything else goes to recycling. I know they do sell some retro computers at shopgoodwill.com, but I haven't seen any in stores for years. And now the GoodWill's by us no longer accept monitors and they haven't for at least a few years. People have been taking their CRT's to the local recyclers since. Some cities such as Dalls have Goodwill Computer Centers. Perhaps they're changing their tune? Today I find myself in a city with a ton of thrift stores that are not Goodwill. Just doing some initial window shopping and look what I find. Poor little speech synth needs to be rescued! i hope you rescued it. That is a sad looking little speech synthesizer. Some callous fool even wrote on it. I hope you adopted it. After a little disassembly, cleaning and Pledge it might look presentable again. After seeing the speech synth in the window, I went inside to see if they had any more retro gear. 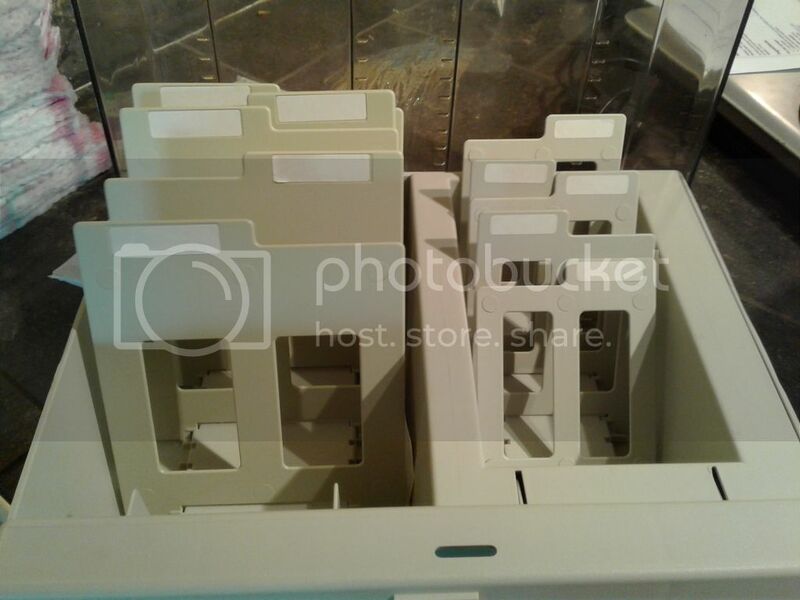 I spotted an Apple ][ disk drive in the "employee's only" area, so I snagged an employee and asked about it. He did a price check online and said they were going for about $20, so he gave me a discounted price of $8.98!! I shook his hand and thanked him. I also asked if he had any more retro computer gear like that, but he did not. I also found a 99/4A power brick on the shelf with the other electronics, so I asked if he had the console. 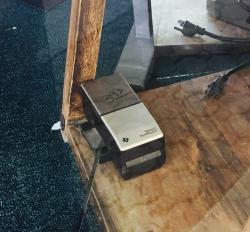 He said there was some other TI stuff a while ago that was in the window with the speech synth, but it already sold. Not sure what someone will do with a 99/4A without the power supply... ? Ah well. I'll get these cleaned up and re-homed ASAP. nice! 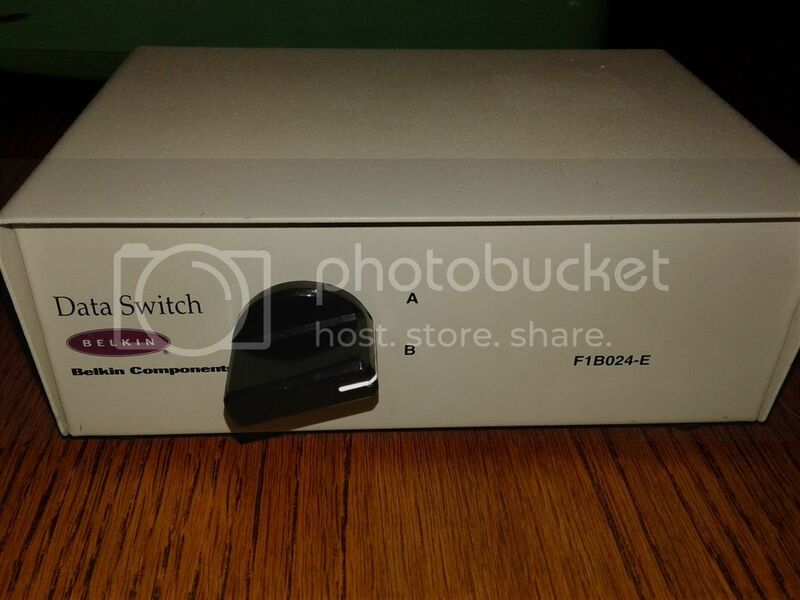 i may have one of those switch boxes floating around in my office still- I have tons of computer/IT related stuff from the last 15 years or so (when I entered the IT field) that frankly I just need to have e-cycled or donated. I remember as a kid my dad going to the local Goodwill 'As-Is' section in Sherman, TX, (which was in the back and looked like a warehouse/loading dock filled with junk and sporting goods, lol) and picking up one of the Atari 2600 (CX-2600 Woodgrain) console and probably 15-20 carts for super cheap. I was wondering why I didn't see that stuff anymore when my wife drags me thrifting. I grabbed a 99/4a in its box recently for $5, looks somewhat complete and in good shape but I haven't tried it yet. score, what a find! Even at 5 bucks you'd come out ahead in parts. 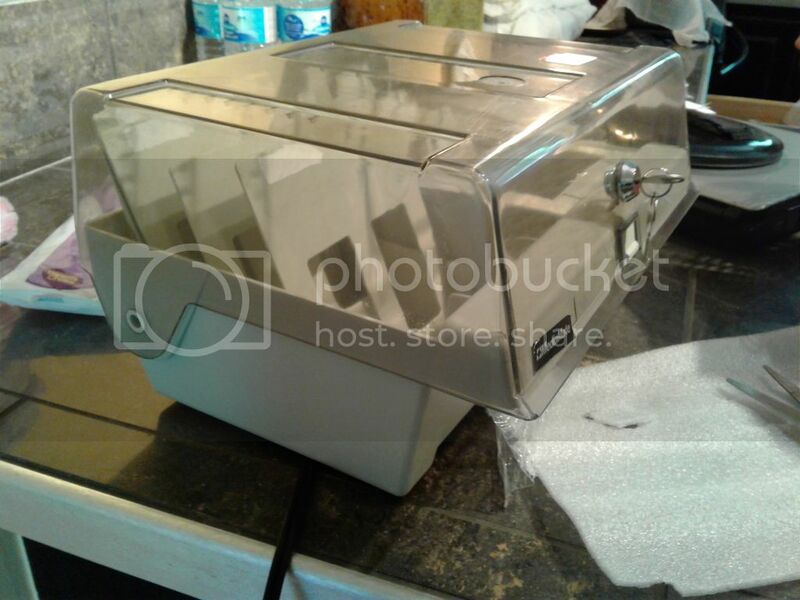 On shopgoodwill today are 3 basic black and silver 4/A's with extras (no PEB) of carts and a joystick and a Speak & Math, a Speak & Spell, and a Speak & Read. And about 100 calculators of various models. Shipping is usually cheaper than Fleabay. This is definitely a disappointing situation yet sometimes they still make mistakes with this policy. I picked up an enhanced Apple //e this year at Goodwill ($5.99, minus 20% discount) because they thought it was simply a keyboard or typewriter. Same goes for the C-64 I know Sparkdrummer found a few months ago. No doubt this policy has resulted in the crushing of old systems. Probably because they don't want to deal with the issues of reselling personal data on hard drives - privacy, etc. I cringe each time I see a classic Mac keyboard, mouse and monitor at the Goodwill, because I know that means the computer itself was needlessly destroyed. For you cart collectors....60 carts plus system.